Well, I finally tried kale. And this was the perfect recipe to try. Kale still isn’t my favorite thing to eat, but this was really good. Just ask my husband. He loved it! 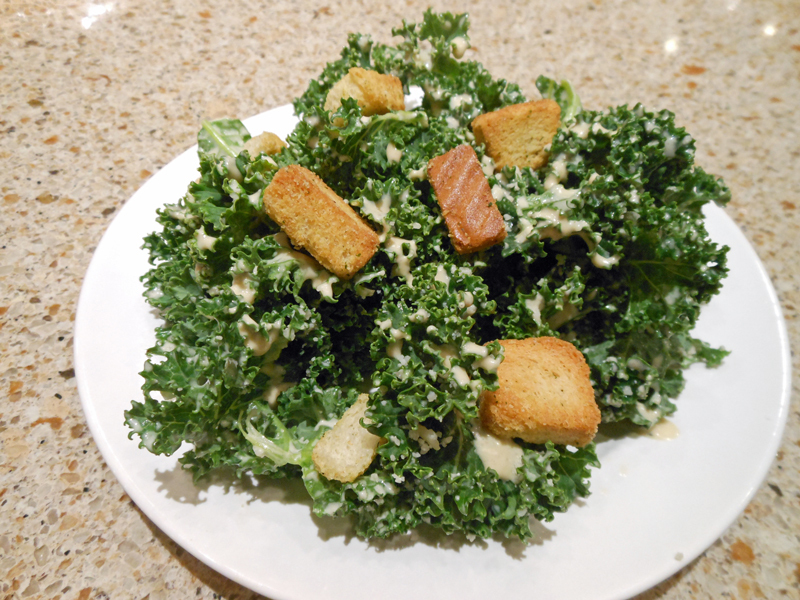 For the salad: Place kale in a large bowl and cover with warm tap water (110 to 115 degrees). Swish kale around to remove grit. Let kale sit in warm water bath for 10 minutes. Remove kale from water and spin dry in salad spinner in multiple batches. Pat leaves dry with paper towels if still wet. I took the easy way out and bought a box of croutons. For the dressing: Process mayonnaise, Parmesan, lemon juice, vinegar, Worcestershire, mustard, anchovies, garlic, salt, and pepper in blender until pureed, about 30 seconds. (I will use my food processor next time.) With blender running, slowly add oil until emulsified.